The standard Law & Economics analysis of racial discrimination has stunted our thinking about race. 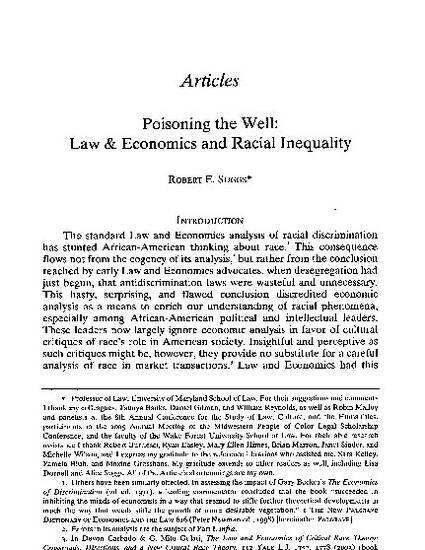 Its early conclusion, that laws prohibiting racial discrimination were unnecessary and wasteful, discredited economic analysis of racial phenomena within the civil rights community. As a consequence we know little about the impact of racial discrimination on commercial transactions between business firms. Laws do not prohibit racial discrimination in transactions between business firms, and the disparity in business revenues between racial minorities and the white mainstream dwarfs disparities in income by orders of magnitude. This disparity in business revenues is a major factor in the persistence of racial inequality. Since discrimination in business activity cannot be prohibited and equal protection doctrine severely limits race conscious programs, policies intended to erode racial barriers to business firms must satisfy the demands of the marketplace. And we currently lack the nuanced understanding needed to design relevant programs. Law & Economics built its flawed analysis of discrimination on the concept of psychic income. Critical to its conclusion about civil rights laws being unnecessary was the implicit assumption that only white workers, but not black workers, could experience psychic gains and losses from satisfying their preferences. Once flawed assumptions, such as this one, are replaced by more appropriate ones, economic analysis can increase our understanding of how race affects market activity and aid the creation of policies that increase minority business activity and reduce racial inequality. 57 Hastings Law Journal 255 (2006).